Rat poisons don’t just kill rats; they kill wildlife too. Wildlife species are exposed to anticoagulant rat poisons when poisons are used in urban and agricultural areas to target species such as rodents. But animals do not die immediately of the internal bleeding these poisons cause. It can take more than a week for a poisoned rodent to die. In the meantime, the poisoned animal may be vulnerable to predators, and if a predator such as a bobcat preys on the poisoned rodent, the bobcat becomes poisoned too. Thus poisons enter local food webs and become especially harmful to top predators. Through a process called bioaccumulation, animals at the top of the food chain absorb toxins from eating lots of different prey animals but their organs cannot filter out the toxins, so poisons accumulate in their systems. As a result, some of the most iconic species in California – bobcats, coyotes, foxes, mountain lions, owls – are the most vulnerable to this form of indirect poisoning. The potential consequences of rat poison exposure on carnivores in the Santa Monica Mountains have been the foremost question of researchers working at the National Park Service (NPS) and UCLA since 2002. I have been a part of this team of biologists since 2006 when I began as a wildlife intern with the NPS. As an intern, I had firsthand experience with poisoned wildlife in the Santa Monica Mountains when I recovered my first dead bobcat. Later that year, I jumped at the opportunity to do a PhD investigating the effect of rat poisons on bobcats. I could see even then that biologists and conservationists alike had no grasp of just how our indiscriminate use of rat poisons is dangerous for wildlife. At the time I came on board, we knew very little. For example, the effect of the anticoagulant rat poison chemicals could vary widely among different animal species that may ingest the poisons. Domestic dogs are 100 times more vulnerable to the toxic effects of these poisons than domestic cats. Would the same trend hold for wild dog species (coyotes, foxes) compared to wild cat species such as bobcats and mountain lions? Data suggested the trend was the same: anticoagulant poisoning was a leading cause of death in coyotes in the Los Angeles area, but NPS biologists documented only one bobcat and two mountain lion deaths directly due to poisoning. Another important trend was emerging for bobcats. Bobcats were dying at unprecedented rates due to uncontrollable outbreaks of mange. It was beginning to look like the population might not survive. Mange is a common skin parasite that was previously rarely fatal to bobcats because their immune systems can suppress the infection. Something was preventing the bobcats’ immune systems from doing its job effectively. Interestingly, veterinary pathologists discovered that every bobcat that died of mange had high levels of anti-coagulant exposure. The pathologists suggested that mange and anticoagulants may be linked, but they could not explain how rat poisons would cause a common infection such as mange to become fatal. NPS biologists and I proposed a hypothesis. Like domestic cats, bobcats may be tolerant to the anticoagulant effects of the rat poisons, but low-level chronic exposure to the poisons had other weakening effects in bobcats, specifically in the way their immune systems functioned. These invisible effects likely increased their susceptibility to mange. To test this hypothesis, we would need to know how many bobcats were actually being exposed to the poisons across the Santa Monica Mountains. Then we needed to know if there were measurable health effects that explained the link between anticoagulant rodenticides and fatal mange infections. We faced two problems. First, we needed to test the immune systems of enough bobcats to understand how their immune systems work before and after they are exposed to rat poisons. That meant spending months capturing animals all over the Santa Monica Mountains and collecting blood and other samples to test in the laboratory. The second problem was more intractable: no one had invented laboratory tests to study the immune function of bobcats. We had to develop our own methods. The study involved trapping more than 125 bobcats from across the Santa Monica Mountains, including Griffith Park. I worked with researchers from all over the country to devise new ways of measuring bobcat immune function. With these new methods, we generated detailed health and genetic profiles of each bobcat we captured. With help from the NPS and US Geological Survey biologists, I also collected 172 bobcats that died of mange or vehicle collision so that I could collect liver samples which are the preferred samples for anticoagulant rat poison testing (the compounds accumulate in the liver over time). With these samples, I then assessed prevalence of and risk factors for anticoagulant exposure in bobcats. The findings confirmed my worst fears. We detected that 89% of bobcats were exposed to the poisons when we used liver samples! By comparison, we detected only 34% exposure using blood samples from the live-trapped animals (we can’t take liver samples of live animals without harming them). This difference in exposure detection reflects that the poisons are in the blood of an animal for a considerably short period of time before it is filtered from the blood stream by the liver, where the compounds can then persist for more than a year! I also discovered how close a bobcat lived to residential and other urban development was the single best predictor of whether that bobcat had been exposed to rat poison. This finding indicated that poison use around residential areas was the primary contributor to environmental contamination. Next, we used health profile data generated from live-trapped animals that were both exposed, and unexposed, to the poisons. We wanted to discover any evidence of the poisons altering immune function such that bobcats may become more vulnerable to deadly mange infection. Unexpectedly, we found explicit evidence that the poisons suppress certain types of immune cells, while stimulating others! In other words, their immune system has to work harder but cannot work as effectively as the immune system of unexposed bobcats. More recently, UCLA colleagues used some of the blood samples I collected to probe whether this immune dysfunction was expressed on a genetic level. The work supported my initial findings; anticoagulants promote immune dysfunction in bobcats. They also discovered other compelling links; anticoagulants change the level of expression of genes associated with skin maintenance. Overall, it is becoming increasingly clear that even when these poisons don’t kill wildlife directly, they still have consequences that may indirectly kill animals by making them vulnerable to other stressors such as disease. This new understanding of the indirect effects of rat poisons raised another question. How else does exposure indirectly endanger bobcats? Bobcats were also being hit by vehicles at alarming rates. Could anticoagulant rat poisons increase bobcat vulnerability to being hit by cars? The poisons might make animals sluggish, or weaken their senses. Crossing roads would then become a much riskier venture. Since we used all our resources on analyzing immune function, we lacked the means to investigate this new hypothesis. FoGP stepped in and supported our preliminary analysis of bobcats hit by vehicles. Next, we needed to find bobcats “freshly” hit by cars to collect blood samples, and, if possible, then test them for anticoagulant exposure. It can be difficult to collect blood from dead animals, and so it has taken a lot of work and patience to build our sample set, and even after years of working in this population, samples were limited. In the end, we managed to scrape together samples from 18 bobcats hit by cars, and from those blood samples, we detected 50% anticoagulant exposure. We compared these findings to the much larger dataset of 185 captured bobcats tested for anticoagulant exposure. Within the capture dataset, 34% of bobcats were found recently exposed to anticoagulants even though they were apparently healthy at the time of capture. After statistical analysis, we did not find a relationship between recent exposure to rat poisons and to being hit by cars. While the newest work funded by FoGP disproved our hypothesis that recent anticoagulant exposure increases bobcats’ vulnerability to being hit by cars, our work overall has shown the unexpected, indirectly lethal effects of anticoagulant exposure in bobcats. The work FoGP funded also taught us something much more important. It isn’t just one challenge these animals face. Living close to humans brings lots of dangers and if these populations are to survive in urban landscapes, we must find ways to contain these risks. We appreciate FoGP’s continued support and interest to help us tackle these important conservation issues. Currently Dr. Serieys is working on two new urban carnivore projects. She created and coordinates the first urban carnivore study in Cape Town through the University of Cape Town, South Africa. The Urban Caracal Project is assessing the effects of urbanization on a wild cat species, the caracal, in Cape Town. An interview with Serieys on BBC talks about her ongoing caracal research at Studying the elusive caracal. Dr. Serieys is also coordinating the Coyote Valley bobcat study through UC Santa Cruz where she’s documenting mange and anticoagulants affecting bobcats in the San Jose, CA region. Top photo courtesy of Dr. Serieys and B. Rowan. 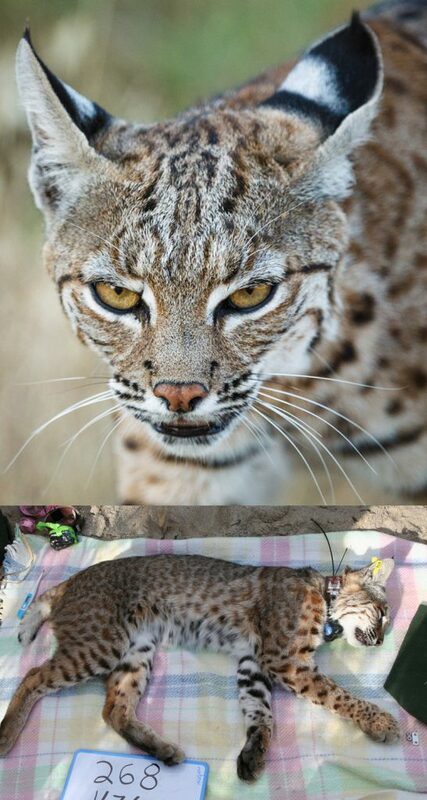 Bottom: Sedated bobcat from National Park Service study in 2011. The study examined behavior, ecology and conservation of bobcats, in particular how urbanization has affected bobcat populations in the Santa Monica Mountains and Simi Hills. Recently California Assembly Bill 2422, designed to restrict rodenticide usage in California was not heard in a committee hearing and missed its opportunity to become legislation in 2018. In the meantime, Friends of Griffith Park is demanding that Rec and Parks adhere to its stated rodenticides use policy. We’re also asking LA residents not to use rat poison! Let’s eliminate the poisons that are KILLING OUR WILDLIFE! We’ll be joined again by birder Don White and FoGP’s Gerry Hans will also be on hand to fill in facts about the Fern Dell area if you have questions (which we’ve noticed is usually the case). The route meanders through the Fern Dell area and then winds slightly uphill toward the Griffith Observatory. It’s a fairly easy climb for bird aficionados of all ages and trust us… you will have fun! If you have binoculars, bring ‘em, but if you don’t, we’ll have a handy-dandy scope for checking out species up close, and people with binoculars are always willing to share. We hope you can join us for this FREE EVENT and remember, to be at Trails by 8 AM! 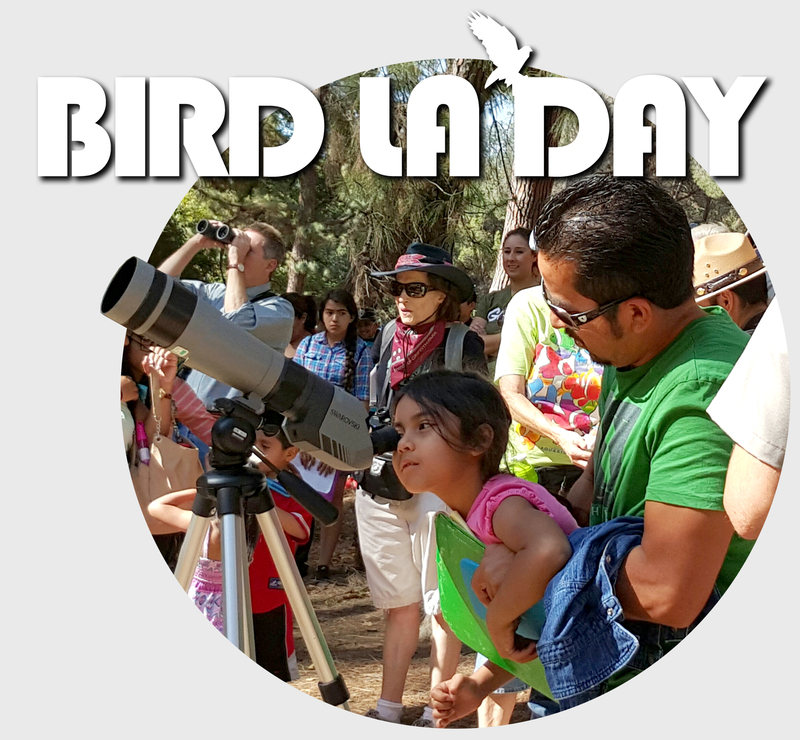 Here’s a second way to celebrate Bird LA Day! 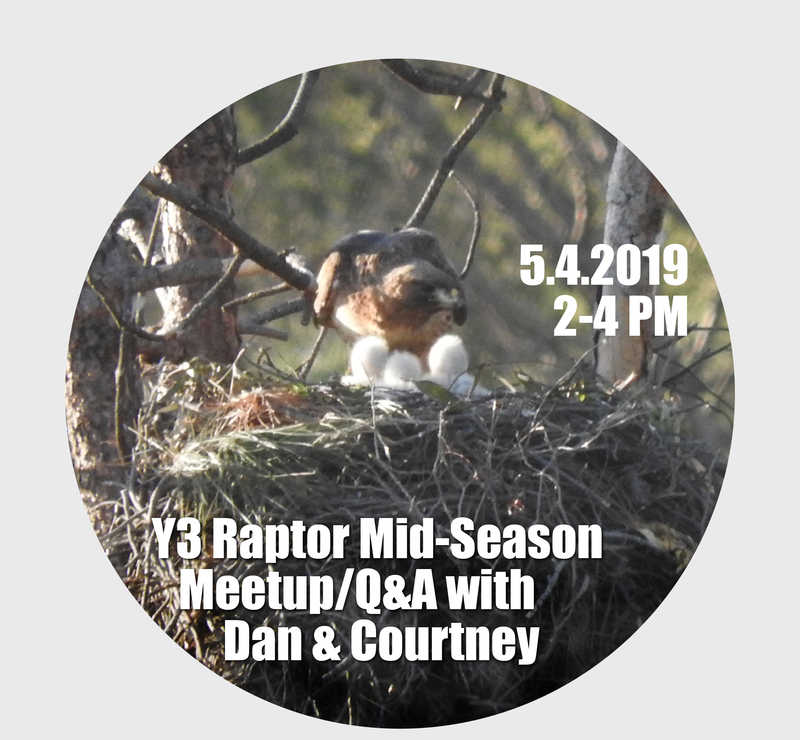 Join our lead biologists, Dan Cooper and Courtney McCammon, for an update and Q&A session about the Friends of Griffith Park Raptor Survey. It’s mid-season, with our raptor volunteers encountering many unique and challenging happenings at their nests. Ask the experts! This is open to anyone interested, in addition to our many raptor volunteers. We’ll have coffee at the Alcove between 2-3:00, and then walk to a nearby nest. This is a FREE gathering, of course, but please RSVP. © Friends of Griffith Park. All Rights Reserved.